Simona Bitmaté (Young Woman) and Finbar Lynch (Older Man). Photo by Simon Kane. This is a sponsored post on behalf of Donmar at the Trafalgar Studios. In a time of conflict, a soldier is billeted to the home of an old man and his niece. Powerless to turn him away, they resist him with silence - a silence that becomes their most potent weapon. This exquisitely constructed human drama examines an excruciating dilemma faced by both the occupier and the occupied. Donmar Associate Artist Anthony Weigh casts new light on Vercors’ testament to the enduring power of the human spirit. Don’t miss the final production in the final Donmar Trafalgar Season. You could win a pair of tickets to see The Silence of the Sea - simply enter your name and email address in the form below. We'll pick a winner at random on Thursday 24 January after 5pm. Good luck! 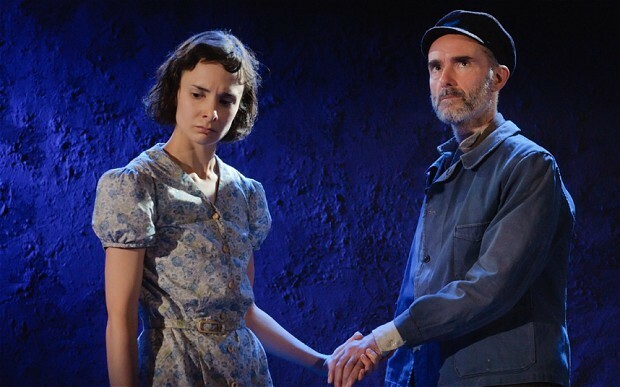 The Silence of the Sea is at Trafalgar Studios. Must end 2 February. Tickets £22 – book now. Winner will be picked at random and notified by email. Terms and conditions: Pair of tickets valid for performances 26 January – 2 February. Subject to availability. No cash alternative. Non transferable. Additional expenses are the responsibility of the prize winner. Promoter reserves the right to exchange all or part of the prize to that of equal or greater value. Usual Londonist competition policy applies.